This has come from another shop full of parts changers. They have replaced almost every component that can be unbolted on the engine including starter, alternator, coilpack, cam and crank sensor. It starts and runs fine when cold, as it heats up it starts to just die every now and then. When it dies two relays in the engine fuse box start to tick, not like a low voltage buzz but rather a regular tick. 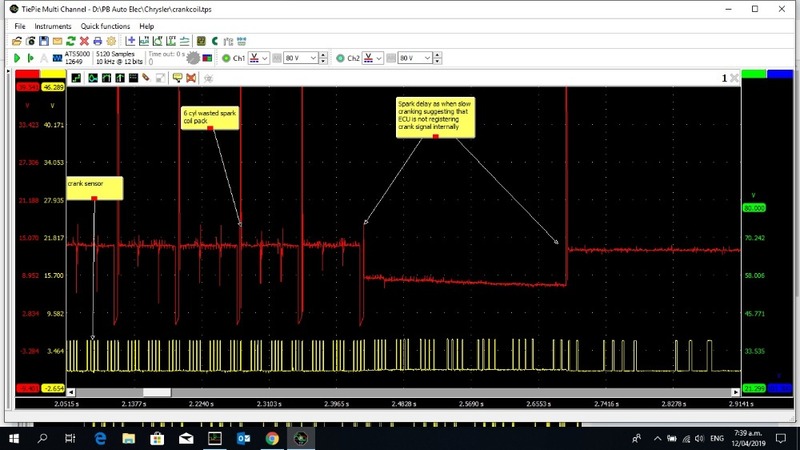 Fault codes that come up right away when it faults are P0320 "crank angle sensor" and P1389 "ASD relay voltage". Due to the first fault code I scoped crank sensor and ignition coil switching. My diagnosis at the moment is that the ECU must be losing the signal internally (it's filed with gum so can't check for dry joins). 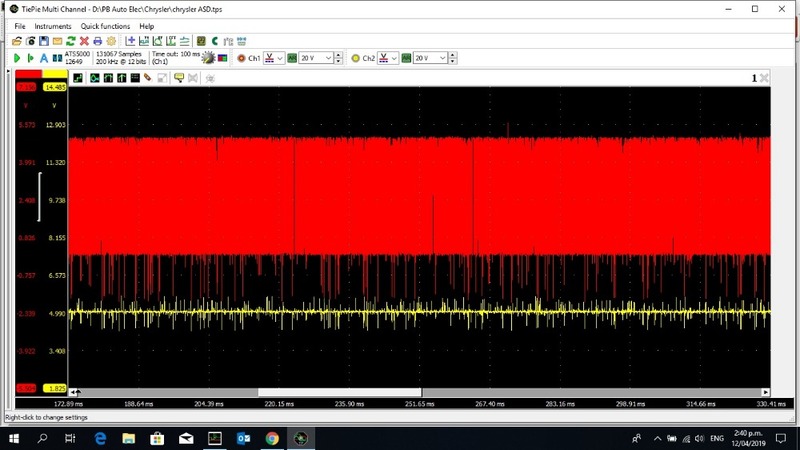 My reasoning is that when it faults the trigger signal for the coil "holds" for a while like some systems do with slow cranking, they hold the spark for a moment to retard timing when the engine is turning really slowly. When it does this the engine dies but the crank sensor signal is still right there at the ECU plug - but it gives a fault for crank sensor signal. Does this sound reasonable? Nope, magnetic interference on the CAM sensor. 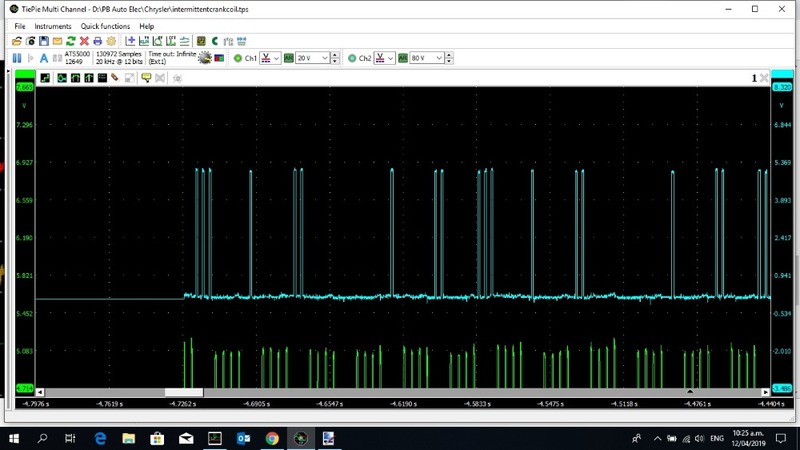 The ECU is seeing so many pulses from the CAM sensor it thinks the crank sensor is missing a signal. How is supossed camshaft sensor looks like? A single pulse? Is that engine timing chain, hydraulic tensioner style? Here's a shot of a good pattern of the CAM sensor 5 seconds before it died. I'm not sure about the mechanical system. but could also still be buildup of magnetic interference. Ok, i see. CKP & CKP are completely synchronized (no mechanical issue there). I think, I would monitor the ASD relay and it's output. And I think you're right about that relay! This time it cut out and the relay was clicking - the hash in this image is on the CAM sensor circuit! 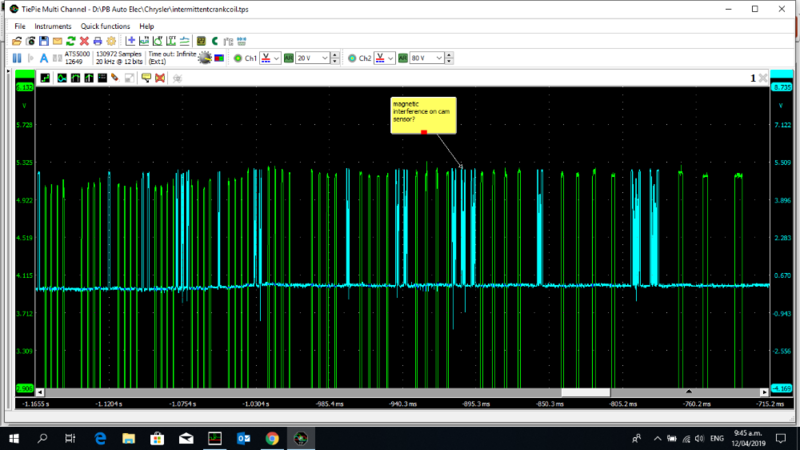 Sometimes the engine just dies, sometimes after it dies the relays click - when the relays click there is this hash on the CAM sensor circuit. How necessary is the ASD relay? I'm wondering what causes this hash as well. It is being generated by the CAM sensor itself. If I snip that wire there is no interference, just 5v on the ECU side and nothing going out. When it is connected again I have hash. New sensor ordered. Desmond6004 wrote: How necessary is the ASD relay? Very. It powers your Ignition Coil and Injectors. But otherwise, does it actually automatically shut the engine down in some situations or is it just badly named? Desmond6004 wrote: does it actually automatically shut the engine down in some situations or is it just badly named? Given those two choices, my answer is that it is badly named. It is not some automatic safety feature that kicks in. One purpose is to prevent dieseling. When you shut the key off, it kills fuel and spark. The new CAM sensor fixed the problem.